Capital of West Prussia. 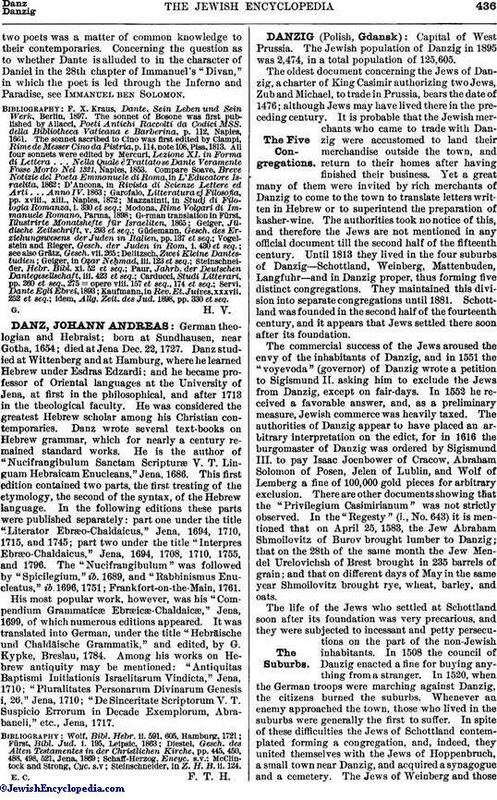 The Jewish population of Danzig in 1895 was 2,474, in a total population of 125,605. The oldest document concerning the Jews of Danzig, a charter of King Casimir authorizing two Jews, Zub and Michael, to trade in Prussia, bears the date of 1476; although Jews may have lived there in the preceding century. It is probable that the Jewish merchants who came to trade with Danzig were accustomed to land their merchandise outside the town, and return to their homes after having finished their business. Yet a great many of them were invited by rich merchants of Danzig to come to the town to translate letters written in Hebrew or to superintend the preparation of kasher-wine. The authorities took no notice of this, and therefore the Jews are not mentioned in any official document till the second half of the fifteenth century. Until 1813 they lived in the four suburbs of Danzig—Schottland, Weinberg, Mattenbuden, Langfuhr—and in Danzig proper, thus forming five distinct congregations. They maintained this division into separate congregations until 1881. Schottland was founded in the second half of the fourteenth century, and it appears that Jews settled there soon after its foundation. The commercial success of the Jews aroused the envy of the inhabitants of Danzig, and in 1551 the "voyevoda" (governor) of Danzig wrote a petition to Sigismund II. asking him to exclude the Jews from Danzig, except on fair-days. In 1552 he received a favorable answer, and, as a preliminary measure, Jewish commerce was heavily taxed. The authorities of Danzig appear to have placed an arbitrary interpretation on the edict, for in 1616 the burgomaster of Danzig was ordered by Sigismund III. to pay Isaac Joenbower of Cracow, Abraham Solomon of Posen, Jelen of Lublin, and Wolf of Lemberg a fine of 100,000 gold pieces for arbitrary exclusion. There are other documents showing that the "Privilegium Casimirianum" was not strictly observed. In the "Regesty" (i., No. 643) it is mentioned that on April 25, 1583, the Jew Abraham Shmoilovitz of Burov brought lumber to Danzig; that on the 28th of the same month the Jew Mendel Urelovichsh of Brest brought in 235 barrels of grain; and that on different days of May in the same year Shmoilovitz brought rye, wheat, barley, and oats. The life of the Jews who settled at Schottland soon after its foundation was very precarious, and they were subjected to incessant and petty persecutions on the part of the non-Jewish inhabitants. In 1508 the council of Danzig enacted a fine for buying anything from a stranger. In 1520, when the German troops were marching against Danzig, the citizens burned the suburbs. Whenever an enemy approached the town, those who lived in the suburbs were generally the first to suffer. In spite of these difficulties the Jews of Schottland contemplated forming a congregation, and, indeed, they united themselves with the Jews of Hoppenbruch, a small town near Danzig, and acquired a synagogue and a cemetery. The Jews of Weinberg and thoseof Stolzenberg formed the congregation of Weinberg. There were Jews in Danzig also, some being under official protection, while others lived there with the connivance, but without the permission, of the authorities. An edict of the council, dated 1605, prohibiting the Jews from meeting for religious exercises, reveals the presence of a community in Danzig itself. In 1616 the Jews were expelled from the town, their presence being permitted only during the six days of the Dominik fair, a fee of three florins each per day being exacted. In 1626 the council accorded certain privileges to Jewish lumberand grain-dealers, and the "Privilegium Casimirianum" was renewed in favor of certain Jews. After the Reformation the situation of the Jews of Danzig grew worse. The contending religious sects were united in oppressing them, and the Reformation produced new efforts for their conversion, which efforts, however, as it appears from a sermon by Pastor Cramer (printed in 1664), were without success. The preacher lamented that a Jew, though sentenced to death, would not embrace Christianity. As the position of the Jews was not legally secured in Danzig during the seventeenth century, they dared not form a congregation. It was only at the beginning of the eighteenth century, when Danzig was stricken with a succession of calamities, that their were admitted to the town to revive its commerce. But they did not enjoy that hospitality for long. About that time the Jews were driven from the bishop's domain, and the fact of their finding a refuge at Danzig roused the anger of the bishop. He protested before the council of Danzig, and, not obtaining any satisfaction, he incited the mob against the Jews. This happened in 1723, and there is no further mention of Jews in Danzig until 1747. Those of Schottland had, by 1724, a well-organized congregation. They founded in that year a society for the aid of the sick and a ḥebra ḳaddisha. The register of the latter was kept in Hebrew from 1724 to 1848. In 1750 Frederick Augustus permitted the Jews to settle again in Danzig, though they were subject to heavy taxes. The Jews of the three suburbs of Schottland, Weinberg, and Langfuhr steadily increased in number. In 1757 the congregation of Schottland numbered 46 contributing members. In 1767 its expenses amounted to 4,644 florins ($580); in 1768, to 6,117 florins ($764); in 1772, to 13,139 florins ($1,642), when the congregation had two synagogues. Till 1777 there was no physician for its hospital, but in that year it engaged Phoebus, the son of Meshullam of Prague. In 1752 the congregation elected as its rabbi Elhanan ben Samuel, formerly rabbi of Fordon. The congregation of Langfuhr settled in that suburb when it was still under Polish protection. The Count of Weiher, owner of that domain, permitted the Jews to settle there, and they built a fine synagogue, acquired a cemetery, and formed a ḥebra ḳaddisha. The cemetery was devastated by the Russians in 1813, not a single tombstone being left in place. The register ( ) begins with 5535=1775; the ḥebra ḳaddisha then counted 47 paying members. 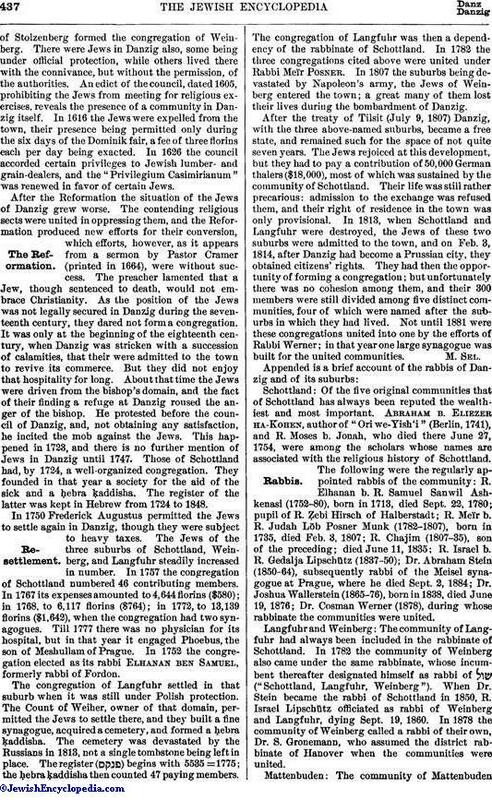 The congregation of Langfuhr was then a dependency of the rabbinate of Schottland. In 1782 the three congregations cited above were united under Rabbi Meïr Posner. In 1807 the suburbs being devastated by Napoleon's army, the Jews of Weinberg entered the town; a great many of them lost their lives during the bombardment of Danzig. After the treaty of Tilsit (July 9, 1807) Danzig, with the three above-named suburbs, became a free state, and remained such for the space of not quite seven years. The Jews rejoiced at this development, but they had to pay a contribution of 50,000 German thalers ($18,000), most of which was sustained by the community of Schottland. Their life was still rather precarious: admission to the exchange was refused them, and their right of residence in the town was only provisional. In 1813, when Schottland and Langfuhr were destroyed, the Jews of these two suburbs were admitted to the town, and on Feb. 3, 1814, after Danzig had become a Prussian city, they obtained citizens' rights. They had then the opportunity of forming a congregation; but unfortunately there was no cohesion among them, and their 300 members were still divided among five distinct communities, four of which were named after the suburbs in which they had lived. Not until 1881 were these congregations united into one by the efforts of Rabbi Werner; in that year one large synagogue was built for the united communities. Schottland: Of the five original communities that of Schottland has always been reputed the wealthiest and most important. Abraham b. Eliezer ha-Kohen, author of "Ori we-Yish 'i" (Berlin, 1741), and R. Moses b. Jonah, who died there June 27, 1754, were among the scholars whose names are associated with the religious history of Schottland. The following were the regularly appointed rabbis of the community: R. Elhanan b. R. Samuel Sanwil Ashkenasi (1752-80), born in 1713, died Sept. 22, 1780; pupil of R. Ẓebi Hirsch of Halberstadt; R. Meïr b. R. Judah Löb Posner Munk (1782-1807), born in 1735, died Feb. 3, 1807; R. Chajim (1807-35), son of the preceding; died June 11, 1835; R. Israel b. R. Gedalja Lipschütz (1837-50); Dr. Abraham Stein (1850-64), subsequently rabbi of the Meisel synagogue at Prague, where he died Sept. 2, 1884; Dr. Joshua Wallerstein (1865-76), born in 1838, died June 19, 1876; Dr. Cosman Werner (1878), during whose rabbinate the communities were united. Langfuhr and Weinberg: The community of Langfuhr had always been included in the rabbinate of Schottland. In 1782 the community of Weinberg also came under the same rabbinate, whose incumbent thereafter designated himself as rabbi of ("Schottland, Langfuhr, Weinberg"). 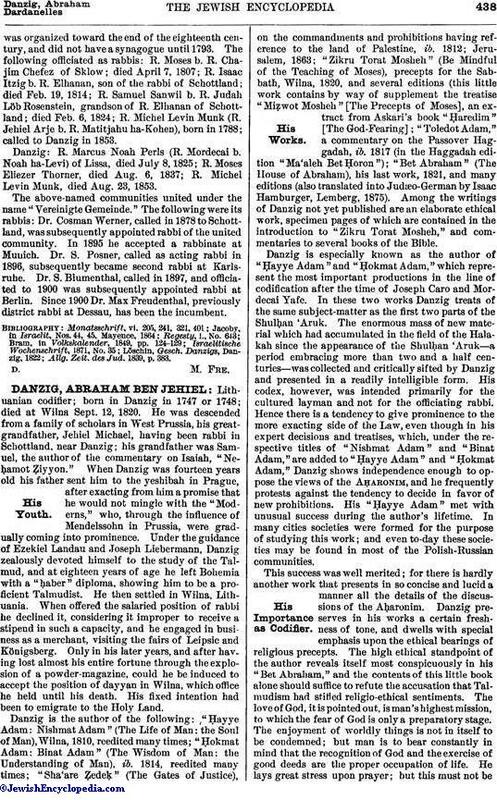 When Dr. Stein became the rabbi of Schottland in 1850, R. Israel Lipschütz officiated as rabbi of Weinberg and Langfuhr, dying Sept. 19, 1860. In 1878 the community of Weinberg called a rabbi of their own, Dr. S. Gronemann, who assumed the district rabbinate of Hanover when the communities were united. Mattenbuden: The community of Mattenbudenwas organized toward the end of the eighteenth century, and did not have a synagogue until 1793. The following officiated as rabbis: R. Moses b. R. Chajim Chefez of Sklow; died April 7, 1807; R. Isaac Itzig b. R. Elhanan, son of the rabbi of Schottland; died Feb. 19, 1814; R. Samuel Sanwil b. R. Judah Löb Rosenstein, grandson of R. Elhanan of Schottland; died Feb. 6, 1824; R. Michel Levin Munk (R. Jehiel Arje b. R. Matitjahu ha-Kohen), born in 1788; called to Danzig in 1853. Danzig: R. Marcus Noah Perls (R. Mordecai b. Noah ha-Levi) of Lissa, died July 8, 1825; R. Moses Eliezer Thorner, died Aug. 6, 1837; R. Michel Levin Munk, died Aug. 23, 1853. The above-named communities united under the name "Vereinigte Gemeinde." The following were its rabbis: Dr. Cosman Werner, called in 1878 to Schottland, was subsequently appointed rabbi of the united community. In 1895 he accepted a rabbinate at Munich. Dr. S. Posner, called as acting rabbi in 1896, subsequently became second rabbi at Karlsruhe. Dr. S. Blumenthal, called in 1897, and officiated to 1900 was subsequently appointed rabbi at Berlin. Since 1900 Dr. Max Freudenthal, previously district rabbi at Dessau, has been the incumbent. Allg. Zeit. des Jud. 1839, p. 383.